My measure of a poem’s quality is often found in the question, “How did the poet think of that?” If that poem should happen to begin an entire collection that has me asking that same question again and again, well, then I know I have something really special in my hands. 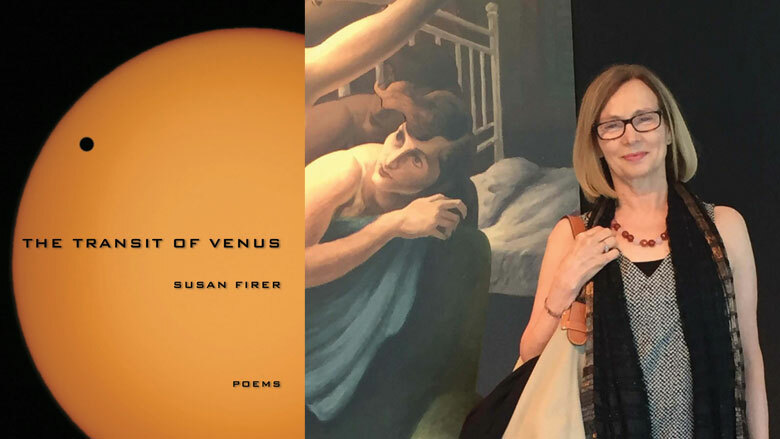 This was my experience reading Susan Firer’s new collection, The Transit of Venus. Q.7 What is the celestial sphere? “The celestial sphere is an imaginary sphere of gigantic (infinite?) radius of which the observer is the center and on which all celestial objects are considered to lie.” For example, the poem is a celestial sphere. (The dead call the waves comfort. house, its own joybog, wild-waved lovebed. squash blossoms and red snapper soup. the ode & elegy are? is no you at the end of the weather. Enter The Transit of Venus and let Firer’s poems transport you to things that you know, and introduce you to things you didn’t know you knew. This process of loss and discovery is something that her poems make nearly sacred. From the letter poems like “Dear Hippocampus,” and “Dear Baby Star, Dear Little Astronaut” to the lengthy exploration of Caravaggio (“Brother Michelangelo”), Firer gives us the opportunity to ponder what is left behind when we go.